Web of Science: How many whales are there in the seas around Iceland? The Marine Research Institute in Iceland has conducted research on whale stocks around Iceland. The species are the fin whale (Balaenoptera physalus), the minke whale (Balaenoptera acutorostrata) and the sei whale (Balaenoptera borealis). According to the counting there are 16,000 fin whales in the ocean between Iceland and East Greenland and about 18,900 in the ocean between East Greenland, Iceland and Jan Mayen (North of 500 latitude). Counting shows that sei whale stock size, a species hunted by Icelanders during the last decades, is at least 10,500. In the mid-Atlantic area there are about 72,000 minke whale of which about 56,000 are in the Icelandic continental shelf area. It is thought that there are about 1,000 blue whales (Balaenoptera musculus) in the Icelandic region. The number of bottlenose whales (Hyperoodon ampullatus) in the seas around Iceland during the summer is thought to be about 42,000. Pilot whales (Globicephala melaena) are common in Icelandic waters and there are thought to be between 100,000 to 200,000 in this area. 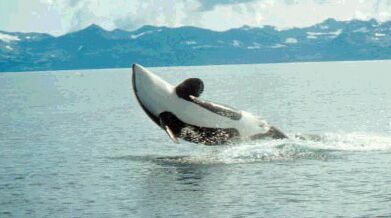 Killer Whale - Orcinus orca. The estimated number of killer whales (Orcinus orca) in Icelandic waters is from 6,000 to 7,000. It is thought that there are about 1,400 sperm whales (Physeter catodon) that come annually to the shores of Iceland. The number of white beaked dolphins (Lagenorbynchus albirostris) in Icelandic waters is from 12,000 to 20,000. The stock size of harbour porpoises has not been researched to the best of my knowledge. Humpback whales (Megaptera movaeangliae) are very rare in Icelandic waters, which can be attributed to excessive whaling by the Norwegians for several decades. They are however being sighted with increasing frequency, particularly in whale-watching tours during the summer. Some of the humpback population travels to southern waters during the winter, to calve. The humpback was declared a protected species in 1955. Some species, such as the narwhal and the beluga whale are vagrants in Icelandic waters, seen only infrequently, but these whales are true Nordic species. If these numbers are all added up we can see that there could be about 3-400,000 whales in the Icelandic waters. Jón Már Halldórsson. „How many whales are there in the seas around Iceland?“. The Icelandic Web of Science 7.3.2005. http://why.is/svar.php?id=4816. (Skoðað 21.4.2019).